Mickey’s (WET) Choo-Choo Jump ‘n Slide 3-in-1 combo moonwalk will bring smiles to all youngsters dreaming of a life with trains. 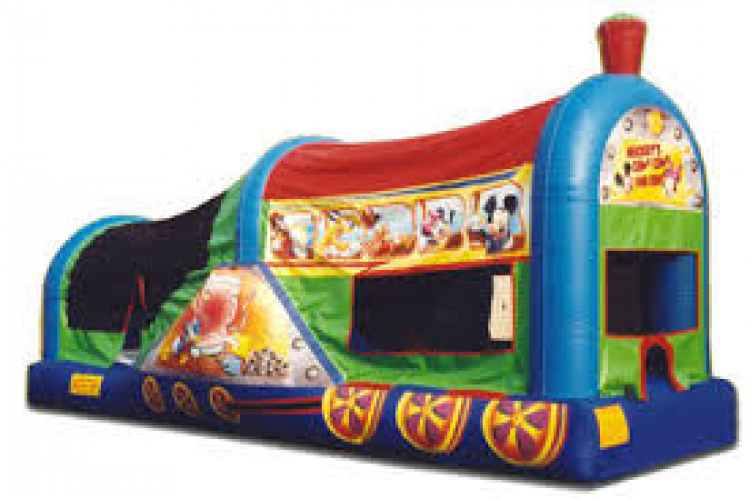 Kids can choose from a climb, a quick, sleek ride on the slide or just bounce away the day on the large jump, either way, each little engineer will have fun riding the rails. Adorable artwork shows Donald Duck the conductor with Mickey Mouse and the gang as passengers in the windows, and a three-dimensional stack on top of the train keeps this Choo-Choo Jump ‘n Slide chugging along! Add this entertaining combo unit to any event or birthday party and lay the tracks for fun.